Normally SG can't say enough good thing about Sergio Rossi. I love the fit and all my SR heels are truly comfortable and stylish. But, I don't know what to make of these fur boots and heels. I think there are small furry things living inside the shoe. Okay, maybe boots are more stylish but those heels are a definitely no for SG. For those gals interested, heels retail for $1095 and booties retail for $1665. Love them ... one of the nicest shoes with fur ever! 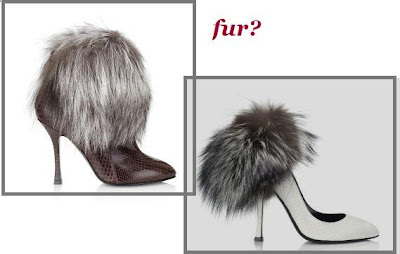 wow i'm not a big fur fan but i love these!